Wearers by the dozen admired the Zanskar GTX’s glove-like fit. Numerous testers found this Scarpa backpacking gear incredibly comfortable. This boot was commended by many owners for its fantastic ankle support. A good percentage of users didn’t spend too much time to break in this footwear. Its overall build was considered phenomenal by several patrons. A gear blogger commended the reasonable weight of the Zanskar GTX. He noted that it won't exhaust hiker's legs even on long trips. Some reviewers only had applause for the Scarpa Zanskar GTX’s super-sticky outsole. This Scarpa footgear received nothing but praises from a couple of wearers for its 2-zone lacing system. A small number of verified purchasers were left impressed with the boot’s A-grade waterproofing. The toe rand received compliments from an experienced backpacker as it protected him on the trails. Professional gear critics had no choice but criticize the boot’s titanic price tag. A tiny fraction of the reviewing community complained about the Zanskar GTX’s inability to stay airy and cool in warmer days. The Scarpa Zanskar GTX shines bright among outdoor enthusiasts thanks to its superbly reassuring ankle support and spectacular amounts of comfort. It also mesmerizes with its satisfying fit and almost non-existent softening period. That said, its ambitious price tag dims the boot’s rather sunny reputation. To conclude, if people can get past the Zanskar GTX’s lofty asking price, they will find themselves geared up with something remarkably impressive. They will deliver years of top comfort and performance. This high-end hiking boot for men is a great choice for a number of reasons. The price is on the higher-end, but the quality and value are through the roof. The Scarpa Zanskar GTX Hiking boots are perfect for around home, trail, backpacking, or hefting the chainsaw around the hacienda. They are a little pricier than some of their competition, but the quality level is worth the premium. Scarpa’s Zanskar GTX is a multi-day trekking boot that can also be used for day-long hikes thanks to its sturdy yet lightweight construction. It owes its modern-classic look to its creatively designed leather upper. Gore-Tex’s Performance Comfort liner makes this boot both waterproof and breathable. A rubber rand at the forefoot, on the other hand, gives it adequate abrasion protection. Its soles, which include the dual-density polyurethane (PU) midsole and Vibram’s Biometric outsole, are extra hardy to grant users ample protection and surefootedness over tricky terrain. As a unit, they also give the boot a proper toe rocker, helping backpackers perform toe offs more naturally. 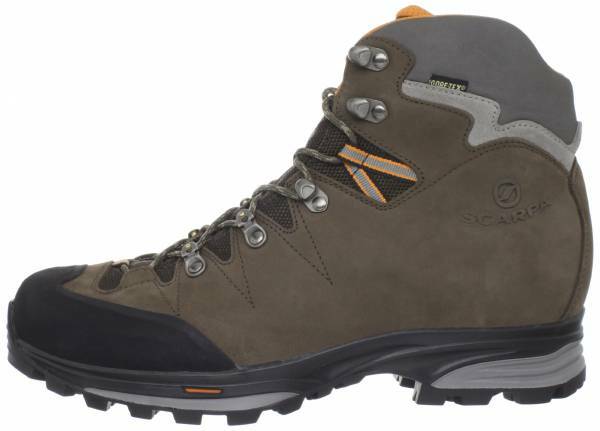 A generally true-to-size, above-the-ankle hiking boot for men is the Scarpa Zanskar GTX. It is listed in several different sizes, which include half sizes, in D – standard width. It is crafted around the Activ Fit BD last which gives the boot a roomier interior, therefore allowing for more internal cushioning. Permitting users to set their desired fit configuration is the gear’s quick lacing system. The Scarpa Zanskar GTX prevents users from slipping over various types of terrain (and even on urban surfaces) with its Vibram Biometric outsole. As it is based on the XS Trek compound, this adequately lugged component gets to offer a responsive kind of traction with comfort and stability. Its aggressively designed lugs self-clean with every step. It is thanks to the boot’s dual-density midsole made of polyurethane that users are granted a balance of stability and cushioning on rocky ground. It comes engineered with a dynamic TPU shank, giving the sole enough medial stiffness for extra arch support. Nested securely atop the Zanskar GTX’s brawny midsole is the Activ Medium footbed. Besides offering extra cushioning, this removable insert also provides additional heel support. Nubuck leather at 1.8 mm in thickness makes up the majority of the boot’s over-the-ankle upper. Its inner liner is imbued with Gore-Tex’s Performance Comfort technology, giving ample waterproofing and breathability at the same time. It also has a rubber rand at the forefoot which offers adequate protection from scuffs, scrapes, and cuts. Fastening the user’s foot within the confines of the upper is the gear’s speed lacing system. Its metal hardware features a set of open hooks and the micro-pulley lace system.